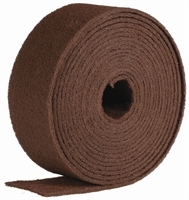 Applications: Due to the flexible nature of non-woven abrasive fleece, (commonly referred to as 'Scotchbrite'), it is ideal for cleaning and sanding curves and shapes. It is much easier on the hands than coated abrasive material. The open structure of the abrasive also makes it less prone to loading up when rubbing down paint, or cleaning. Works well on most surfaces, including metal, wood, plastics and fillers. See 'More Information' for further selection guidance. Non-woven fleece with abrasive added. Nylon base bonded by resin. Grades 'A' (eg AC) use aluminium oxide grit. Grades 'S' (eg MS) use silicon carbide grit. 10m roll lengths. See listing for widths. Also Available: Other grades and roll sizes can be supplied to order. Please ask. General Purpose (GP): This is a good cleaning material, ideal for quickly removing surface contaminants but with minimal damage to the base surface. Very Fine A (VFA): For light surface removal and heavy cleaning. Between coats paint keying. Fine A (FA): Removing rust and tarnish and surface coatings. Base preparation for painting. Coarse A (CA): De-nibbing wood, rust removal from metal. Smoothing down with light surface removal. Medium S (MS): A good alternative to Coarse A on metal, leaving a bright finish. Sharper grain works better than 'A' grades on harder surfaces. Note: Other grades are available. Please ask.